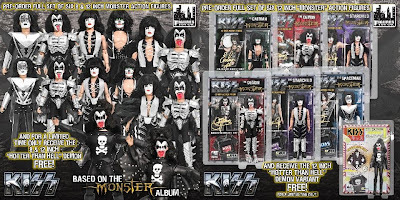 Coming in early April is the KISS Series 4 action figures (set of eight standard figures — 8-inch and 12-inch figures) — a complete set of all 12 KISS Series 4 action figures, including variants. Each 12-inch variant is limited to 500 pieces worldwide, and 8-inch variants are limited to 1,000 pieces. The tongue-thrusting vampire bassist known as "The Demon" is highly detailed and features 16 points of articulation. The Demon's face paint and stage outfit were derived from KISS' album entitled "Monster" that was released last fall. His highly detailed legendary style comes complete with bat wings and rubberized armor/boots. Each piece of armor has multiple bones sticking out of its plates. Variant edition has blood splattered all over his face! The glittering guitarist and lead vocalist known as "The Starchild" is highly detailed and features 16 points of articulation. The Starchild's face paint and stage outfit were derived from "Monster". His star-studded style comes complete with a black and silver vest and black pants with real metal chains. Variant edition includes a black and green feather vest outfit! The "out of this world" guitarist known as "The Spaceman" is highly detailed and features 16 points of articulation. The Spaceman's face paint and stage outfit were derived from "Monster". His futuristic style comes complete with a studded shirt and silver vest, as well as his atmospheric platform shoes! This lion-maned drummer known as "The Catman" is highly detailed and features 16 points of articulation. The Catman's face paint and stage outfit were derived from "Monster". His feline style comes complete with a black and silver vest (with spider web design on the back), and black pants with snake design! Clamshell packaging allows you to open the packaging to see the figure. Each 8-inch figure comes with a commemorative "Monster" mini 2 X 2-inch album cover, while each 12-inch figure comes with a mini concert t-shirt. If you pre-order this before April 30 (or until supplies last) you will get a free 8-inch and 12-inch Hotter Than Hell Demon bloody variant! 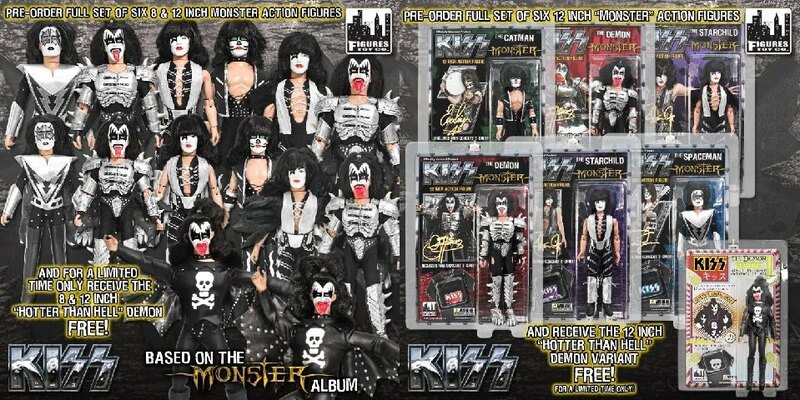 You can pre-order the KISS Series 4 figures here. KISS are currently on an Australian tour — its first in five years — with Motley Crue and Thin Lizzy.